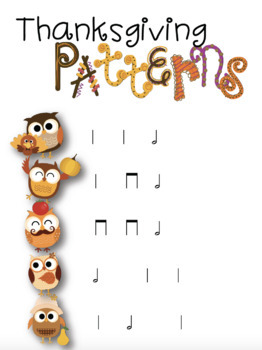 *A slideshow for each of the following rhythms: Ta and Ti-Ti (Quarter notes and eighth notes), Quarter Rest, Tika-Tika (Sixteenth notes), Half note, Ti-Tika (Eighth/ 2 sixteenths), Tika-Ti (2 sixteenths/ eighth), Syncopa (Eighth/ Quarter/ Eighth), Tim-ka (dotted eighth/ sixteenth), Tam-ti (Dotted quarter/ eighth), and 6/8 rhythms (includes dotted quarter, dotted half, dotted quarter rest, 3 eighths, and quarter eighth). You can view each PDF like a slideshow by going to "view," then "full screen." 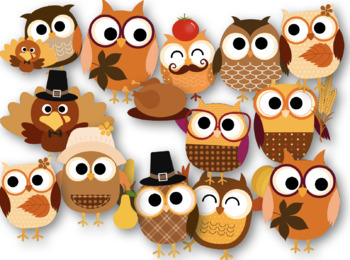 Each slideshow comes with a title page with 13 cute Thanksgiving owls. Either throw a squishy or koosh ball at your SMART board, or have students tap the owl of their choice, and read that pattern! 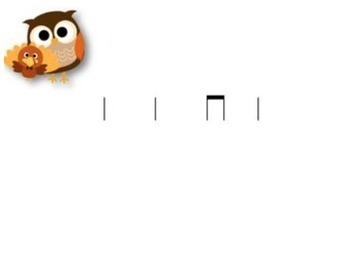 Each owl will bring up a different slide. *A reading assessment with directions: This can be done in learning centers. Students read one of five owl patterns individually to the teacher; a rubric is included! Please note that the ta and ti-ti set as well as the syncopa set are included in Songs and Activities for Thanksgiving. 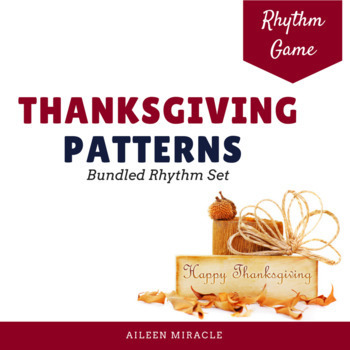 Please note that the other rhythmic concepts are only included in this bundle. Looking for more Thanksgiving materials? Please rate this product, and follow me for product updates and freebies. You can visit my blog at www.mrsmiraclesmusicroom.com. Thanks for looking!